Online Sales closed. Tickets may still be purchased at the door! Fun music for the family, including popular favorites of Leonard Bernstein's West Side Story, John Williams' Olympic Fanfare, Leroy Anderson's Blue Tango, and more! 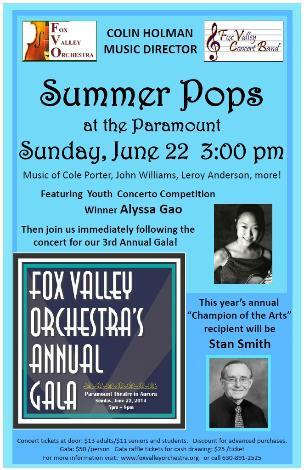 Featuring Alyssa Gao, winner of the 2014 Youth Concerto Competition! Join the FVO and friends at the Third Annual Fox Valley Orchestra Gala Fundraiser, located in the beautiful Grand Gallery of the Paramount Theatre. Immediately following the afternoon’s 3pm performance in the Paramount Theatre, you’ll be treated to great food, drink, and live entertainment. Enjoy beautiful art from members of the Aurora Art League and partake in the many silent and live auctions to benefit the Fox Valley Orchestra and its affiliated youth programs. Have a great time while supporting a great cause! Space is limited, so order your tickets now! Only $50 per person for all the food you can eat! NOTE: Online ticket sales close on Friday evening prior to the event. Tickets may still be purchased at the venue. For additional ticket information call 630-891-2526.